Edited by Puppet_Master at 15:39, 28 Feb 2018. 1. MCrEdit: adding new creatures (to 1000) with lot of properties and abilities. 2. MTwEdit: adding alternatives in towns and edit building`s trees. 3. Dwellings.dll: adding new dwellings types 17 and 20 (to 1000). ATTENTION: not compatible with Amethyst-plugin. Edited by majaczek at 15:57, 25 Jul 2017. I see you published sources... is your plugin open-source? EDIT: Avast says your code is malicious - false positive? Edited by Drwal at 18:10, 25 Jul 2017. Creatures are in editor map? Edited by Baronus at 20:04, 25 Jul 2017. Great!!! How you do it? We need this? How eg. edit building tree order? Give new hero skills and more skill lvls and will be ideal! Lucky day as I see! Do you know what I must do to avoid this? Edited by Drwal at 23:25, 27 Jul 2017. Anyone add new unit to Heroes III? Edited by Puppet_Master at 11:23, 28 Jul 2017. - Unpack archive on ERA/Mods catalog. - Set monsters attributes in MCrEdit program. 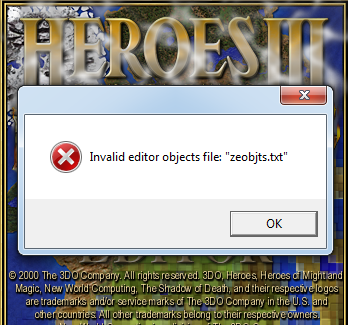 - Add info on zaobjts.txt, zeobjts.txt, zobjcts.txt. - Add strings in Zcrtrait.txt. - Increase number of monsters in MapEdPatch/Options.oni. Edited by Drwal at 12:25, 28 Jul 2017. Thanky you I will try. Maybe quick video with one example? Cant see Zcrtrait.txt and MapEdPatch/Options.oni in Trexton folder. I can not yet. I'm on the Internet by phone. Copy it from ERA resources. Edited by Drwal at 12:47, 28 Jul 2017. Something I do wrong. Editing original units works wonderful, but cant add new. I will try again soon. Pls, if you can, pls record short video how you add units. I am from acidcave.net and i would like make guide there + news about this program on main website. Okay, I'll try my next weekend. Edited by Drwal at 18:43, 01 Aug 2017. Almost had a heart attack when the "music" started, but the tool is very nice. Edited by Puppet_Master at 18:27, 08 Aug 2017. Forgot to mention: Typhon is present new ERM-command for managing town dwellers (to replace ! !UN:T due to alternatives). Set a type of monster to hire in towns. Also, file "s/Typhon - UNZ fixes.erm" contains all working UN:Z-corrections for scripts "Neutral Town" and "Universal Creature Upgrades". Do you have an alternative Downloadlink? that googledrive link doesnt work for me, even as signed in user..
Great machine. If you add new cities it will be final great victory! I see big progres explosion in Era! This ine dont work too?